A detailed guide that will help you learn our sharpening method. 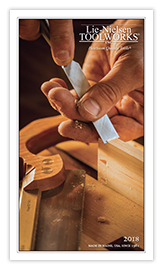 This PDF covers our recommended sharpening supplies, how to hone a blade that is new, how to sharpen older blades in need of more work, recommended angles for sharpening, and honing secondary bevels. 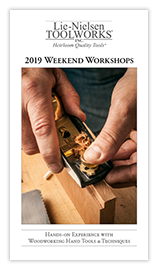 Learn more about the summer Weekend Workshops offered this year at our shop in Warren, Maine. Deneb Puchalski's Angle Setting Jig is a great tool for setting the correct projection of blades and chisels in a honing guide. 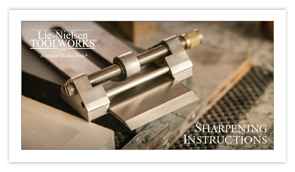 This PDF offers plans and material suggestions so you can assemble your own, and recommended tools for sharpening. 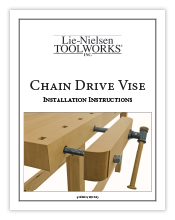 Instructions for installing our Chain Drive Vise Hardware. 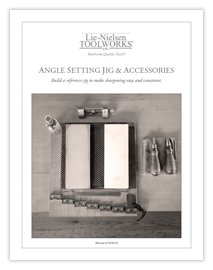 Includes directions for building the wooden Vise Jaws. If you plan on using our Vise Hardware, we suggest reading these directions through before beginning your workbench build. 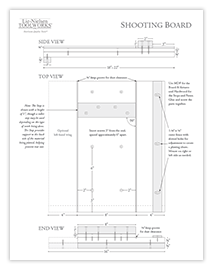 Includes End and Edge Shooting Board configurations, as well as plans for Mitered Fixtures. 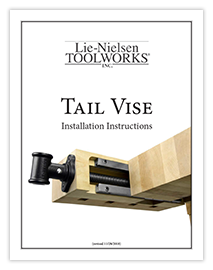 Instructions for installing our Tail Vise Hardware. If you plan on using our Vise Hardware, we suggest reading these directions through before beginning your workbench build. Download a digital version of our most recent catalog. 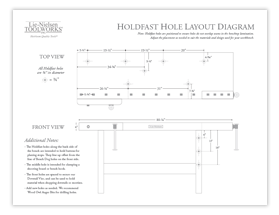 This diagram shows the layout of the Holdfast holes included on our standard workbenches.